Jan Gustafson (First, Gladstone) made the prayer banner as described on the ELCA website www.elca.org/prayer/resources/prayerbanner.html. 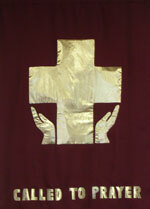 The banner is used in worship and in the prayer chapel. You can make your own banner for your congregation! providing a drawing of the banner and giving directions on creating your own banner. Jill Lemke (Shepherd of the Lakes, Sayner, WI – www.themark-itplace.com or 888/284-4363), conducts classes on making paper mache hands, which then display prayer beads. Jill is available to lead workshops on making these hands or visit her shop on Main Street in Sayner, Wisconsin. 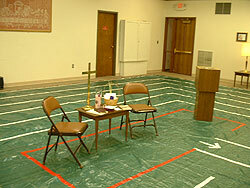 Several congregations in the synod have a “prayer labyrinth.” First/Gladstone, Immanuel/Escanaba, Faith/Three Lakes, and Fortune Lake all have labyrinths of one kind or another. Contact any of these congregations for more information on how to make and use your own labyrinth!